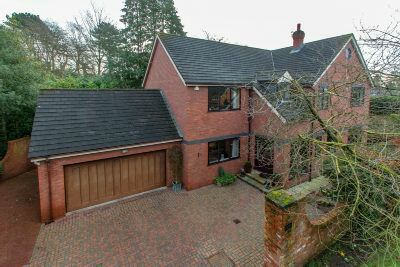 A fabulous, individual architect designed and built Detached family home, constructed circa 1989 for the current owners to their exact specification and peacefully situated on a lovely, mature 0.40acre South facing Garden plot in this little known location, just off Green Walk in Bowdon. 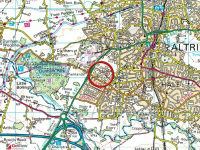 As such, the property is within walking distance of Bowdon Lawn Tennis Club, Altrincham Town Centre, its facilities, The Metrolink and the popular Market Quarter, Hale Village with its range of popular restaurants and eateries and Altrincham Boys' and Girls' Grammar Schools. In addition, the open space of The Devisdale is on the doorstep with country walks across Dunham Golf Course towards Dunham Park. The property offers superbly proportioned family accommodation arranged over Two Floors, extending approximately 3400 square feet (plus substantial outbuilding) and is well presented throughout with good specification Kitchen and Bathroom fittings and is ready to move into with the minimum of fuss. The family accommodation provides Two Reception Rooms to the Ground Floor in addition to a Study and a fabulous 400 sqft Open Plan Family Room and Breakfast Kitchen and has Five Bedrooms to the First Floor served by Two well appointed Bathrooms, one being En Suite to the Principal Bedroom. Most usefully within the grounds there is a substantial 450 square foot Detached Outbuilding, originally forming part of the adjacent Victorian property, and this provides a fabulous facility to provide a Games Room, Teenagers Den or even a potential Guest Suite, subject to modifications. 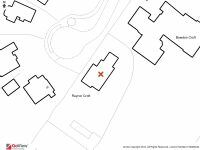 The plot on which the property stands is truly wonderful, being supremely mature and of a fabulous size providing attractive outlooks from all of the Principal Rooms and affording a high degree of privacy. Double Entrance doors to the Entrance Porch with tall window to the side and vaulted ceiling, with exposed brick walling and natural wood flooring. Double doors to the Hall featuring a turning spindle balustrade staircase to the galleried Landing. Continuation of the natural wood flooring. Wood panelled doors lead to the Ground Floor Accommodation. Corniced ceiling. Ground Floor WC with a window to the side and well appointed with a white Laufen suite with chrome fittings, providing a WC and vanity unit wash hand basin. Tiling to the floor. Lounge, a beautifully proportioned room with a large picture window enjoying an aspect of the Garden and with a further window to the side. Intricate corniced ceiling. Adam style fireplace surround with inset marble fireplace with living flame fire. Dining Room with window to the front, corniced ceiling and a door to the Family Room and Breakfast Kitchen. Study with a window to the side and fitted with home office furniture to include desking and extensive shelving. 400 sqft Open Plan Family Room and Breakfast Kitchen. A fabulous, split level, day to day informal family Living, Dining and Working Kitchen space, with the lower Living Area having particularly wide windows and patio doors enjoying an aspect of and giving access to the Gardens. The Breakfast Kitchen Area has a further window overlooking the side Gardens and the Kitchen is fitted with an extensive range of hand painted finish wood fronted units with granite worktops over with an inset sink unit. Integrated Neff double oven, hob, extractor fan, Miele dishwasher and space for freestanding fridge freezer. Connecting door to the Dining Room and Utility Room. A truly spacious Utility Room with a door and window to the side and extensive built in units and sink unit. Space for washing machine and dryer. Courtesy door to the Garage. First Floor Galleried Landing with natural light via a dormer window to the side and with a corniced ceiling. Wood panelled doors give access to the Bedroom Accommodation. Principal Bedroom One with windows to two elevations and enjoying a fabulous Garden aspect. Extensive built in furniture to include, wardrobes, dressing table, drawers and bedside tables. Door to the En Suite Bathroom, also accessed directly via the Landing, beautifully appointed having been recently refitted with a suite in white with chrome fittings, providing a double ended bath, 'his and her' wall hung wash hand basins, wall hung WC and shower cubicle with drench shower head. Extensive tiling to the walls and floor. Underfloor heating. Mirror fronted vanity units and toiletry cupboards. Ladder radiator. Halogen lighting. Bedroom Two with a wide window enjoying a lovely rear Garden aspect. Bedroom Three with a window to the front and extensive built in wardrobes, drawers, dressing table and bedside tables. Vanity sink unit. Bedroom Four with a window overlooking the side Garden area. Vanity sink unit. Bedroom Five with a window overlooking the side Garden and having an airing cupboard housing the hot water cylinder. The Bedrooms are further served by the Family Bathroom, again recently refitted with a suite in white with chrome fittings, providing a bath, wall hung wash hand basin, WC, bidet and an open shower area with drench shower head and thermostatic shower. Extensive tiling to the walls and floor with underfloor heating. Window to the side. Ladder radiator. Halogen Lighting. 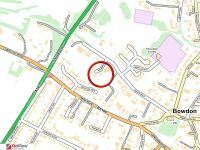 Externally, the property is approached via a block paved Driveway which returns to provide extensive Parking for a number of vehicles and in turn leading to the Integral Double Garage. The whole of the front Garden area is walled enclosed for the upmost privacy. Gates lead down either side of the property to the side and rear Gardens. The side Garden area is a substantial area within itself, laid to a gently sloping area of lawn with deep borders of mature shrubs, bushes, trees and plants providing screening. A paved pathway returns down both sides of the house to a patio returning across the back of the property, accessed via the Family Room and Breakfast Kitchen. Beyond, the Garden is laid to an expanse of lawn with a central pathway and again retained within deep borders. Beyond the initial line of sight there is a further Garden area within which is the substantial Outbuilding with areas of planting, compost and a traditional Kitchen Garden. The Outbuilding, referred to affectionately by the vendors as Camellia Cottage, is approached through a stable door and has two substantial rooms featuring attractive, multi paned Georgian style windows including an arched window feature in addition to a skylight window. There is a large walk in storage area in addition to a WC. There is potential to enhance this Outbuilding further if required to provide a Teenagers or Dependant Relatives Suite. Camellia Cottage completes what is a really lovely family home and genuinely enhances the fabulous family accommodation of this superbly located and positioned property.